Virginia looks to clinch the ACC regular season title. Location: John Paul Jones Arena: Charlottesville, Va.
Look, if you’re reading this you already know everything you need to know here. Hunter is awesome. Guy is awesome. Jerome is awesome. Some other dudes are really good. Their defense is awesome. Their offense is super efficient. They play slow. They’ve sucked in the tournament. They have our number. —Louisville has lost eight straight games to Virginia and has been beaten by the Cavaliers in nine of the nine 10 they’ve played as members of the ACC. —A loss to Virginia will automatically make Louisville the No. 7 seed in next week’s ACC tournament. With a win and a Clemson win over Syracuse, the Cards would be the 6-seed. —A Virginia win would give the Cavaliers at least a share of their fourth ACC regular season championship in the last six years. —Virginia will celebrate the Senior Day of starting center Jack Salt. —Virginia has won its last three games by 24 or more points. They are just the fifth team in ACC history to accomplish that feat. —Three Louisville players pulled down double-figure rebounds in back-to-back games against Notre Dame (Malik Williams 13, Jordan Nwora 11, V.J. King 10) and at Boston College (Jordan Nwora 12, Dwayne Sutton 10, Malik Williams 10). It was the first time U of L has accomplished the feat since a five-overtime decision at Notre Dame on Feb. 9, 2013, and the first time in regulation since Dec. 18, 2008 vs. Mississippi. —Virginia leads the nation in scoring defense (54.1) and three-point field goal percentage defense (.269). The Cavaliers are also second nationally scoring margin (+18.0), third in fewest turnovers per game (9.2) and field goal percentage defense (.373), and fourth in three-point field goal percentage (.414). —Virginia is 180-42 (.811) in 13 seasons at John Paul Jones Arena. The Cavaliers are 14-1 inside the building this season. —Louisville is 1-6 all-time against Virginia in games played in Charlottesville, and 0-4 in games played at JPJ. —UVA has held Louisville to 59 or fewer points in eight of 10 contests since the Cardinals joined the ACC in 2014-15. —Louisville has a 4-6 record in games played all-time on March 9, winning two of its last three on that date. 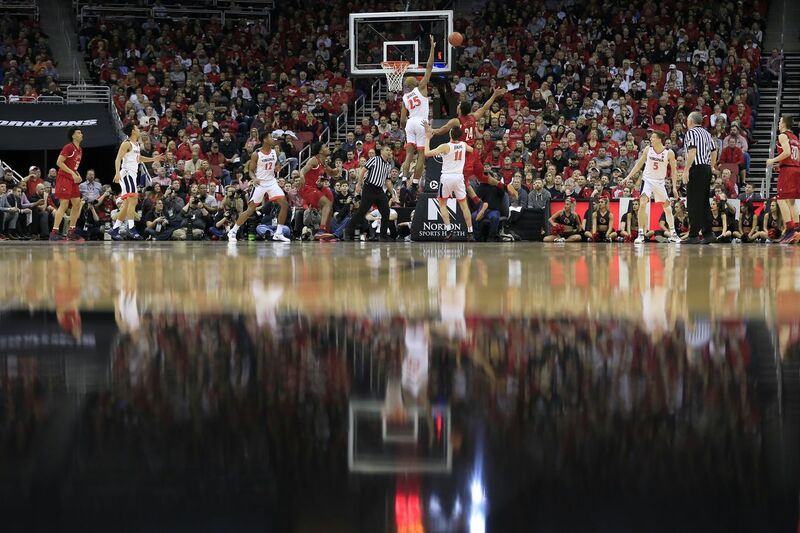 —Virginia made a season-low two three-pointers in the first game against Louisville, but outscored the Cardinals 38-4 in the paint. —In that game, De’Andre Hunter scored a career-high 26 points, 19 of which came in the second half. —Louisville has won 148 consecutive games when scoring at least 85 points in regulation. —Louisville is one of just four schools which have won 20 or more games on the court in each of the last 16 seasons (also Kansas, Duke and Gonzaga). The Cards need just one more win to extend that streak to 17.